While everyone in the media and on Twitter rip Peyton Manning apart for not being as good as he used to, Bill Belichick isn't buying in to the criticism. In his weekly Wednesday press conference, Belichick said he would never underestimate the Broncos quarterback, who has been at the center of many big games against Belichick-coached teams. 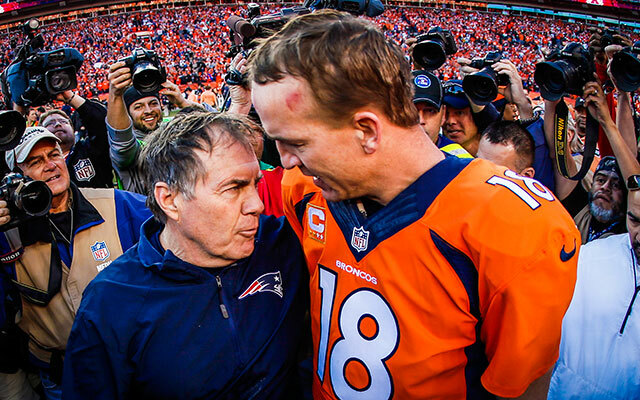 "Peyton is a great player," Belichick told reporters on Wednesday. "He's had as . . . You know, we've had tremendous battles against him through the years. There isn't a player off our team that I have any more respect for than Peyton Manning. His preparation, his consistency, his skills. I would never, ever, ever underestimate him under any circumstances." Against the Steelers, Manning threw for 222 yards, no touchdowns and no interceptions. His deep ball isn't what it used to be, and his receivers drop a ton of passes. He basically been reduced to a game manager. What's more, Tom Brady has more touchdown passes (3) at Sports Authority Field than Manning does (1) this season. Astounding. It'll be interesting to see how the Patriots defend Manning, given that he's likely to throw more short to intermediate passes. Emmanuel Sanders and Demaryius Thomas obviously have the speed to get down the field, but you may see them run more crossing patterns, comeback routes, etc. in order to get yards. Either way, expect Belichick and the Patriots to be prepared for anything.